Discussion in 'InkJet Continuous Flow Systems' started by aaa, Jul 5, 2012. I have almost automatic printer shaking. My printer is built-in furniture. 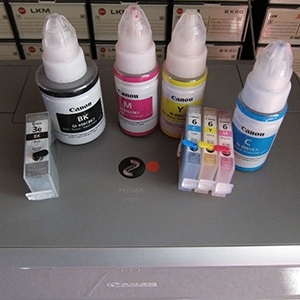 The ink level in cartridge highly dependent from the ink level in tank. Hat, can you explain why pigment ink clogs Mariotte CISS? In plain English so it is easy to understand and no technical stuff. but if left idle for long periods these same particles will separate then sink to the bottom and settle there. which in time will prevent the proper flow of ink to the print head, if left unchecked will lead to total head failure (Canon printer). even the printer itself then this type of CISS system will probably work but for how long who knows.. If this is really true why other types of CIS won't have the same issue because of the property of pigment based ink? This is quite technical, not just plain English. All CIS systems have problems. It may be true the pigment based ink makes it ever harder to work. The Mariotte principle seems to be a better way to build CIS on. I believe All Epson ink cartridges are designed based on principles similar to Marriotte's Bottle. The goal is to deliver a constant ink flow. Mariotte bottle works in standard mode. The air temperature (in tank) decreases and (or) atmospheric pressure increases. The air temperature (in tank) increases and (or) atmospheric pressure decreases. My Mariotte's bottles evolution. Part with air has 50% ink. The nominal balancing level is red. The real balancing level is blue. Do you want to see a a detailed description (instruction, manual), how to make homemade Mariotte's bottle?